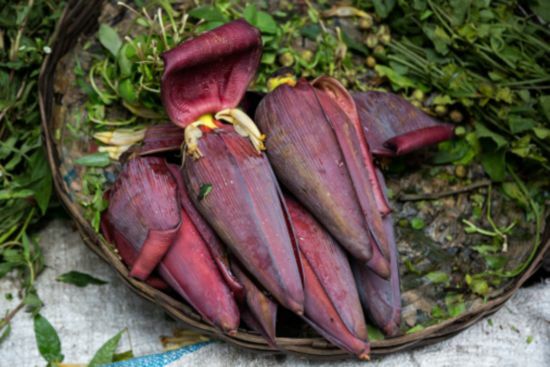 Vazhaipoo (Banana Flower) is a popular ingredient in South India often used to make Vazhaipoo Vadai, Vazhaipoo Cutlet, Vazhaipoo Poriyal etc.. Rich in fiber and potassium, it is helpful in lowering blood pressure and digestion related ailments. 2. Fry the dals, peppercorns, red chillies and asafoetida for a minute. 3. Add the jaggery, vazhaipoo, tamarind extract and salt. 4. Add a little water and grind together to a fine paste. Feel free to comment or share your thoughts on this Vazhaipoo Thuvaiyal Recipe from Awesome Cuisine.